Originally from southern Asia, cucumbers reached other parts of the world by being pickled and surviving the long trade routes to the Mediterranean, Northern Africa, and America. 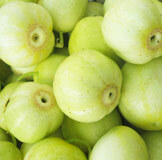 Today, fresh varieties are found in the markets, ranging in length from 6 to 20 inches, in various shades of green. This vegetable’s high water content, – inspiration for the saying “cool as a cucumber” – gives recipes a crisp, refreshing taste. Cucumbers are very sensitive to heat, so choose ones that are displayed in a cool area. Cucumbers should be firm, rounded at their edges, of a bright medium to dark green hue. Thinner cucumbers will generally have less seeds than thicker ones. Cucumbers can be eaten unpeeled and the seeds are edible. But if you wish to remove the seeds, cut the cucumber lengthwise and use a spoon to gently scoop them out. Cucumbers can be sliced, diced or cut into sticks. Adding cut raw cucumbers in leafy or mixed salads will enhance the meal’s texture and give it a cool taste.